Detached house renovated in a farmhouse typical Bessin. We chose to keep a countryside spirit at this old farmhouse that does not deny its past. It is a comfortable, authentic house with a rustic character. It has been converted into a country style with antique family furniture, purchased in the auction room or flea market. This house is attached to an unoccupied building, close to our home and another cottage. -R-d-c: kitchen, living room with fireplace, armchairs and sofa, wc. -Stand: 2 bedrooms (1 double bed 140x200, 2 single beds 90x190) with shower and sink in each room. Electric heating. LL. LV. TV. DVD. - Common that can be closed. -Garden lounge and barbecue available. This house is particularly spacious and pleasant. You will appreciate the calm of the site, the proximity of the big beaches of St Laurent, the sites of the Débarquement (of Ste Mère Eglise in Arromanches). Sea less than 5 km (supervised beach). Dogs on a leash in the yard. 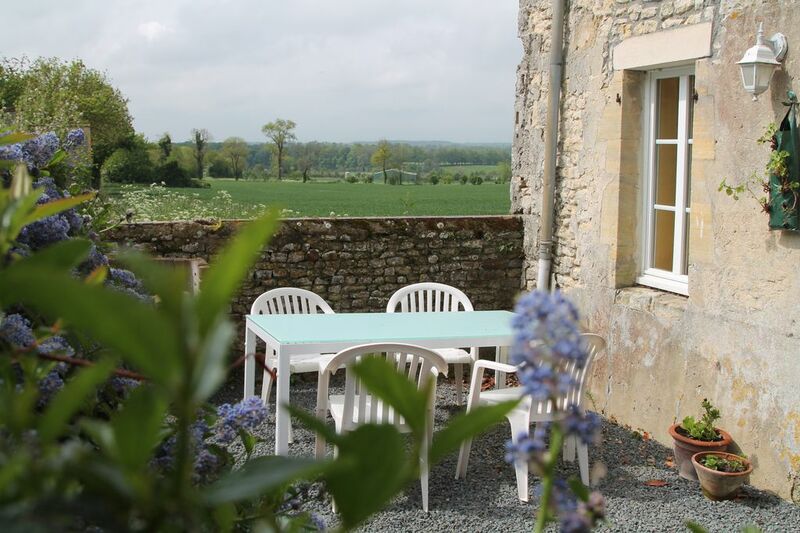 Comfortable, cosy gite in a lovely quiet location. We spent a really enjoyable week in this gite, Valerie was a kind, friendly and very helpful host. The gite had everything needed and more, and it was very well located for accessing DDay beaches, as well as Bayeux. Port en Bessin was only a short drive away for shops and a good range of restaurants. The area was quiet and peaceful. We would love to go back again! My husband and I spent a week at this lovely gite. It was clean and well equipped for all our needs. The owners Valerie and Philippe communicated well before our stay and were on call if we needed them. Thank you both. It was very convenient for our trips to Omaha beach, Bayeux for the tapestry museum and the Cathedral and we absolutely fell in love with Port en Bessin all these destinations were only a few kilometres away. We would recommend this gite. If you are going to see Normandy & the D-Day beaches - stay here - if you're lucky enough to find your dates free! For the same price (or less) as a tacky motorway motel you can have your own little bit of paradise! 2 lovely gites within a historic Normandy Farm, plenty of peace and space, only a few minutes from Omaha beach and central for all the historic sites. Took my 13 year old & a friend to tour the beaches & museums for a week. Owners Philippe & Valerie were fantastic and helpful hosts and this gite was perfect to go back to after a long day touring the sites for a cool local cider and an evening barbecue. Just beautiful - even if you're only passing through for a few days, have a look at dates available and give yourself a treat and a bit of peace in a lovely place. Many thanks for your lovely review. You are definitely one of our best guests ! Great home, great location and great hosts! This place was in a great location for all the Normandy activities. It is an awesome old house with a nice set up for the rooms. Valerie and Phillipe are great hosts, they gave us a bottle of local cider to greet us and were very responsive to any questions and requests. We plan to stay here again! Thanks very much for your nice review. It was our pleasure to host you. You are welcome back anytime. Valérie et Philippe sont très gentils. A notre arrivée on a trouvé une bouteille de Cidre, et des œufs frais ont été organisés par eux . Un gîte à a conseiller. Ce fut un réel plaisir de rencontrer Nelson et sa famille. Des invités discrets, sympathiques et enthousiastes comme on aimerait en rencontrer plus souvent. Nos échangent ont été agréables.